Stop No. 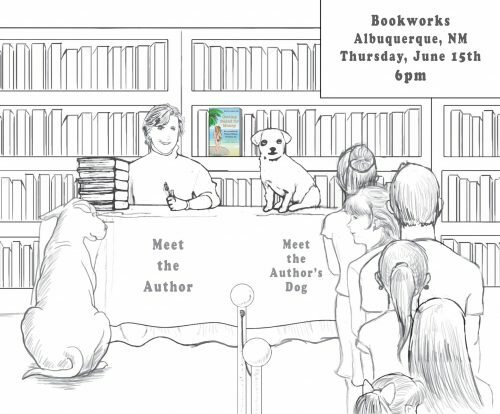 2 on my Author & Her Dog Book tour for GETTING NAKED FOR MONEY: An Accidental Travel Writer Reveals All might seem like a bit of a homecoming. Several friends from Tucson have moved to Albuquerque — and, in fact, that’s one of the cities I was considering when I was trying to decide where to move from NYC. Tucson won out because I thought I never wanted to see snow again and Albuquerque has more of a winter. Some 20+ years — and the increase of global warming — later, I’m rethinking that stance. I chose the stops on my book tour carefully. Arizona for Dummies was originally supposed to be The Complete Idiot’s Travel Guide to Arizona and New Mexico. How the Dummies took over the Idiots and how New Mexico was omitted from the book are both long stories; the former is in my book, the latter was one of the anecdotes that got cut. Suffice it to say that, even though I didn’t move there, I came to love New Mexico and, especially, its version of Mexican food. And I’ve heard nothing but great things about Bookworks, both from friends who have visited as book lovers and authors who have read there. How could I not request a reading there? Madeleine is a charmer and the star — in my eyes — of the Tucson dog scene, but there is no question who is top dog in Albuquerque — nay, in all of New Mexico. 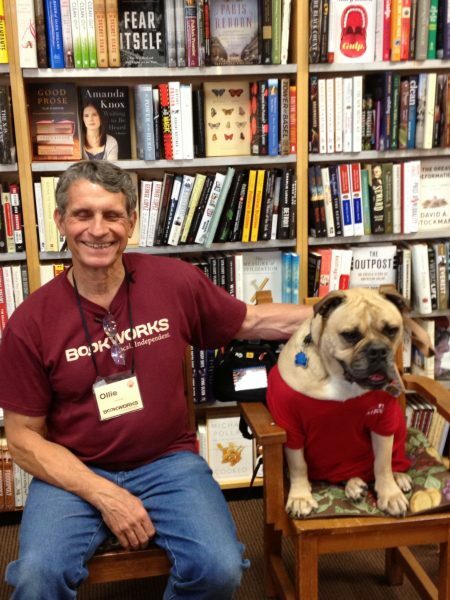 That would be Travelin’ Jack, the charming bulldog pictured at Bookworks at the top of this page. I interviewed Jill Lane, Jack’s campaign manager, amanuensis, and all around bone vivant for Animal Cafe back in 2011 (!). I am very excited that I will finally get to meet them — or at least Jill after all these years of virtual acquaintance. Wow! You’re going to be a busy, busy lady for a few weeks, aren’t you?! Have fun! And give Madeleine a treat for me!